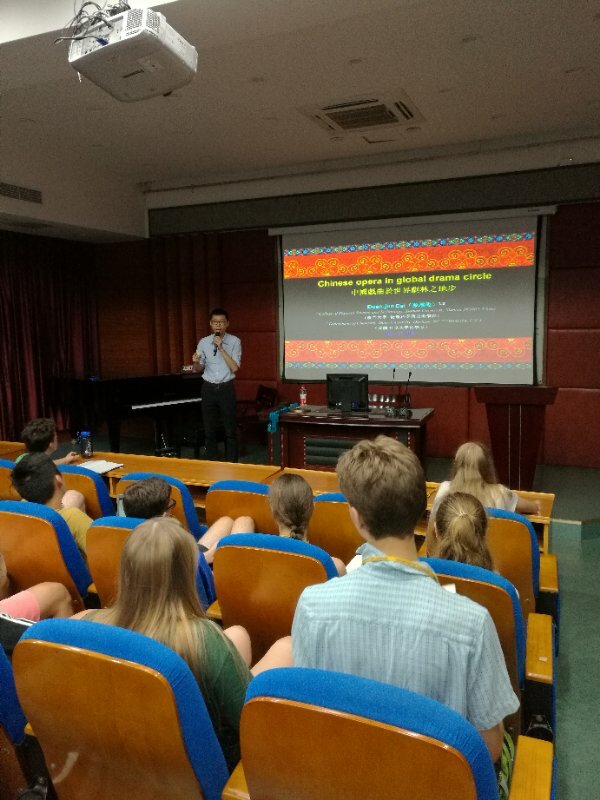 Yesterday afternoon, we had the opportunity to listen to a guest speech by professor Duan-jun Cai about the Peking Opera Style. 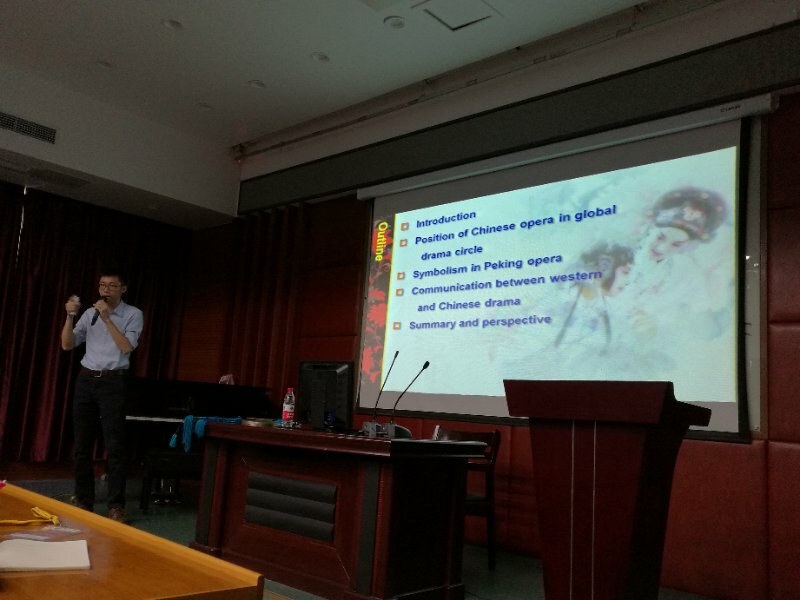 Although Cai teaches and conducts his research in the Department of Physical Sciences at Xiamen University, his lecture regarded the Peking Opera, a hobby, particularly within the context of global theatrical styles. Despite it having nothing to do with his profession, Professor Cai demonstrated an unbelievable breadth of knowledge in Peking Opera and gave us an in-depth overview of its history and elements. Particularly interesting in the first part of Cai’s presentation was the story of the first Peking Opera—not actually a Beijing-specific form, the Opera began in its current form when opera troupes from different parts of China travelled to Beijing to perform for the Qianlong Emperor (the sixth emperor of the Qing Dynasty) and soon became popular throughout China. Professor Duan-jun Cai next focused on the specifics of Peking Opera pieces—this involved a comparison with opera forms from India and Greece culminating in our better clarity of understanding regarding Peking Opera storylines, set pieces, costumes, singing, and dialogue. It was amazing to learn about the meanings of different-colored masks in Peking Opera: this is helpful in our being able to comprehend the storylines of Opera pieces without understanding every word of Chinese being spoken. Finally, Professor Cai showed us a brief clip of an Opera performance (this was especially interesting as it featured a well-known 60-year-old male Peking Opera actor portraying a 16-year-old girl) before answering our questions and actually performing a Peking Opera song himself. It was amazing to hear his voice change so dramatically to portray a male character, then change once again to portray a female. Particularly in the context of our program and coming trip to Beijing (which will involve an evening watching Peking Opera), this talk provided invaluable context and excitement for what is to come.